Introducing Ice Cream Social, the riveting true story of an iconic mission-driven company. Ben & Jerry’s has always been committed to an insanely ambitious three-part mission: making the world’s best ice cream, supporting progressive causes, and sharing the company’s success with all stakeholders: employees, suppliers, distributors, customers, cows, everybody. This is the first book to tell the full, inside story of the inspiring rise, tragic mistakes, devastating fall, determined recovery, and ongoing renewal of one of the most iconic mission-driven companies in the world. No previous book has focused so intently on the challenges presented by staying true to that mission. No other book has explained how the company came to be sold to corporate giant Unilever or how that relationship evolved to allow Ben & Jerry’s to pursue its mission on a much larger stage. 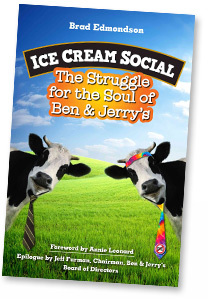 Read more about the book and see praise for Ice Cream Social.